Wash the fish and place it in an oven proof dish. Mix the olive oil, crushed garlic, black pepper and some salt to make a marinade. Brush the marinade on both sides of the fish, this will also coat your oven dish to prevent the skin from sticking to it. 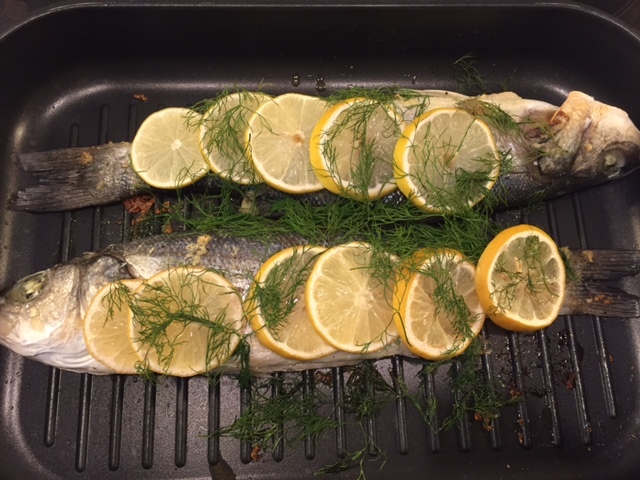 When the oven is at 200°C, place the fish in the oven for 15 min. In the meantime cut the lemons in slices and take the soft pieces of the dill off the harder stems. At the 15 minute mark, place the lemon slices on the fish. I added the dill another 5 minutes later and had everything cook for another 5 minutes, i.e. 25 minutes total. While the fish is cooking, wash the tomatoes and cucumber and cut both of them in slices. Arranged the slices, alternating tomato and cucumber on two plates. Check if the fish is done (by seeing if it comes off the middle bone easily), take one fish out of the overn. Switch the oven of and place an empty oven dish in the oven. Fillet the first sea bass and keep it warm in the second dish, fillet the other one and keep it warm. If you have not filleted a fish before, google “how to fillet sea bass”. Melt some butter as a sauce. Pour some salad dressing over the vegetables. 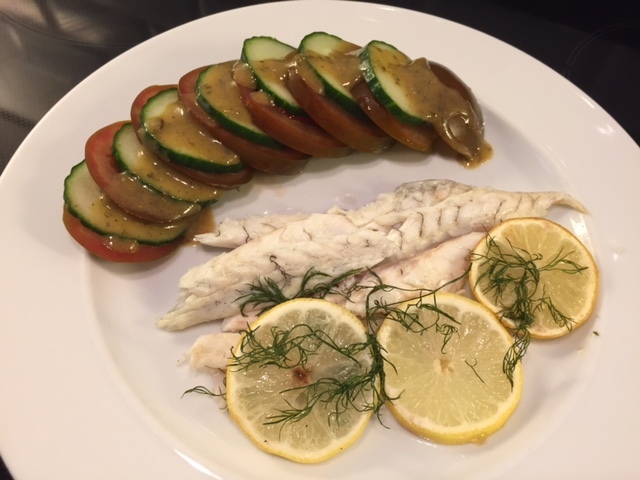 Arrange the fish fillets on the plates and decorate with the lemon slices and dill. Pour butter sauce or olive oil over the fish, squeeze some of the lemon and enjoy!